You have to love this chili – Matt’s Chili with Chipotle Peppers, not only can you eat as a typical chili, but you can morph it into two more meals, this one and Matt’s Chili over Pappardelle Pasta. This recipe will make two servings like the one shown in the picture. Make two servings at the same time if entertaining a large group, or make one dish, let your guests graze and then make another one later. This will make sure the nachos will be warm and not soggy. This recipe uses a leftover chili – Matt’s Chili with Chipotle Peppers and needs to be made ahead of time to make this recipe. Make sour cream garnish by combining sour cream and milk to make a creamier version for garnishing as shown or just use sour cream as is. Place half of the 14 ounce bag of chips onto a large serving dish. Pour 2 cups of Matt’s Chili evenly over chips. 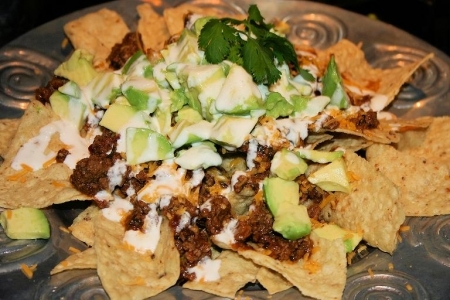 Top with one of the diced avocados, 1 cup of the cheese and garnish with a ¼ cup of the sour cream mixture and cilantro and serve family style. Repeat for second dish, if serving.